Over 20 million people rely on Any.do to organize their life and get more done. "IT'S A MUST HAVE APP" on any device (NYTimes, WSJ, USA Today & Lifehacker). 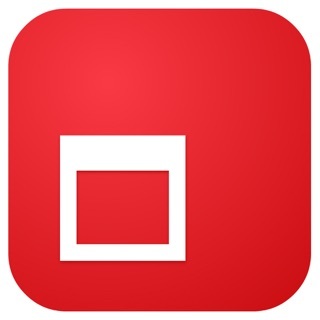 An all-in-one to do list, calendar, planner and reminders app. Free & Simple. To easily create reminders we added voice entry so you can just speak your mind and we’ll add it to your to do list. For better task management flow we added a calendar integration to keep your agenda always up to date. To enhance your productivity we added cross-platform support for recurring reminders, location reminders, sub-tasks, notes & file attachments. To keep your to-do list always up to date, we’ve added a one-of-a-kind daily planner. 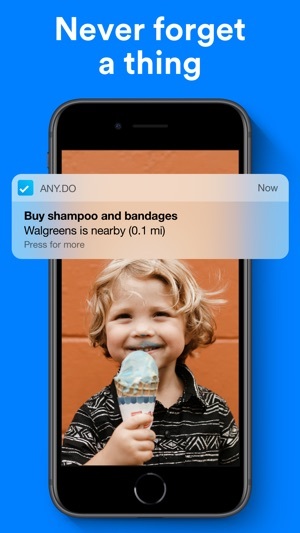 Any.do was designed to keep you on top of your to do list and calendar with no hassle. 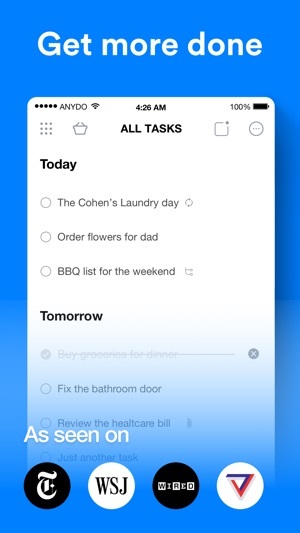 Thanks to the intuitive drag and drop of tasks, swiping to mark to-do's as complete, and shaking your device to remove completed from your to do list - you can keep yourself organized and enjoy every minute of it. 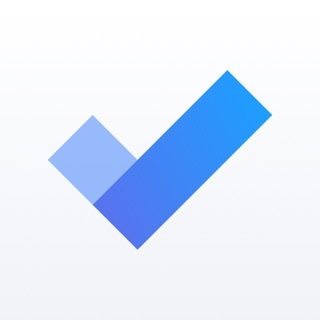 Add a to do list item straight from your email inbox by forwarding do@any.do. Attach files from your computer, Dropbox, or Google Drive to your tasks. Print, Export and share your lists of groceries and daily errands. 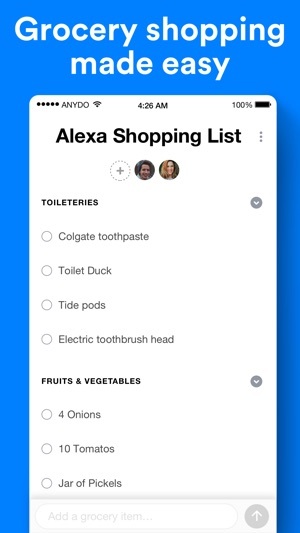 Any.do task list is also great for shopping at the grocery store. Right there on your to do list is a handy shopping list option that you can share with others. Forgot to buy post-it notes? Want reminders? Simply create a list on Any.do, share it with your loved ones and see them adding their shopping items in real time. Your plan would be localized to fit your country's currency. You can cancel the auto-renew subscription at any time from the account settings on iTunes, but we are unable to issue refunds for any pay periods that have already been billed. ● Love Any.do? Share with your friends! ● Upgrade to Premium and boost your productivity. 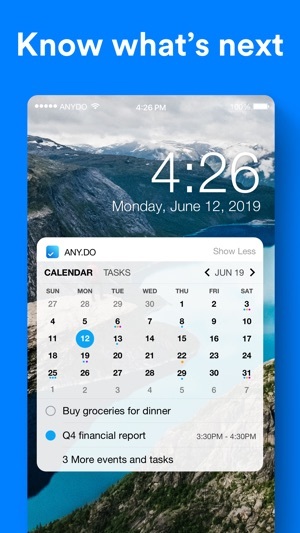 ● Add the Any.do Widget to easily access your daily agenda. ● Exciting updates are coming soon, stay tuned! By the way, App Store reviews are very helpful to us. If you find Any.do useful would you mind taking a moment to rate and write a review? We’d greatly appreciate it. It is one of the best apps out there. It helps me to manage my tasks very easily and it’s plan my day feature is the best with all those animations and makes it very easy for me to reschedule unfinished tasks very smoothly without the hassle if writing time and title and again or making a new task. Please try it to manage your daily goals. I use both mobile and web versions. Very helpful both sync and can plan wherever I feel like. I use it for my office todo list to grocery lists. One thing I still dint figure out how to set a reminder to go to Someday while creating. I have to create and then drag under Someday list. I have been using this app for many years and trust me this is your go to app when you need to make or maintain a todo list. This app easily takes that part of my brain where I have to remember the numerous things I have to do. Kudos to the team working on this app and needless to say, I love it!